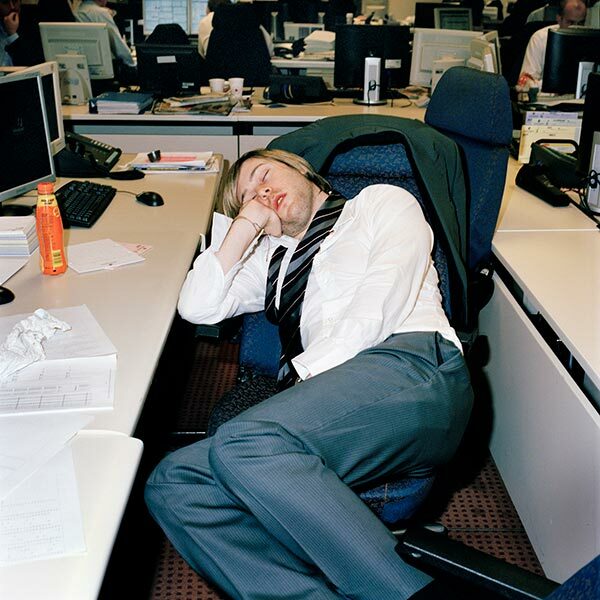 The work here explores office life around the globe. Office life, perversely perhaps, can be beguiling: the furniture, rituals, dress code – mundane but fascinating – if one knows where to look. What this project is really about, however, is globalisation. Wherever we are, office life is similar: we share the same computers (Dell, IBM) and software (Microsoft); we even work for the same companies owned by other companies we have probably never heard of. Lenvo is the second biggest maker of computers acquiring IBM in 2005, and who has heard of them? The technology and information revolutions have continued the processes started in the industrial revolution; unifying and simplifying human procedure. Work in the office like factory work is, often, reduced to a series of simple interactions. Desk Job crosses continents and nations but the treatment shrinks the world by documenting a similar daily struggle. The brash use of flash accentuates the idea that their environment overwhelms these subjects. The repetition of motifs – phones, pot plants, in trays – reinforces uniformity. The employee is defined by the few cubic meters around them. The Homogeneity enforced by corporate life is concerning. However, we also see resistance: Companies strive for uncluttered office spaces, whereas individuals have an urge to colonise. There is humour inherent in this conflict. Although this project was started before the recession, it is particularly relevant today. Seeing the worker, oblivious to the machinations of the CEO, heroically navigating their way through the day’s tasks, will hopefully inspire empathy and a recognition of our commonality across culture, continent and corporation. In these pictures we see the tension between employer and employee, but ultimately workers are intrinsic to the organisations they serve; and there is an underlying hopeful message. It may not be immediately obvious but the community’s need to improve its environment is almost always a response to the individual’s struggle. US Candidate for Senate, Elizabeth Warren’s made a very good point in a recent speech: “Corporations are not people. People have hearts, they have kids, they get jobs, they get sick, they cry, they dance. They live, they love, and they die. And that matters, because we don’t run this country for corporations, we run it for people.” It echoes the impulse behind these pictures perfectly.